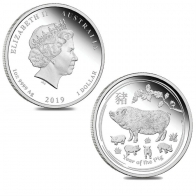 2019 Australian Year of the Pig 1 Oz 24k Gold .9999 Fine. 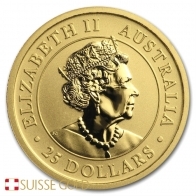 These coins are part of the Perth Mint lunar series, which is available in gold and in silver. Each year, a new coin is released in line with the Chinese Lunar calendar. The Perth Mint Year of the Pig Lunar series is available in gold in one ounce and fractional ounce sizes. The front of each coin features an image of Queen Elizabeth II, with the coin's weight, fineness and year of minting at the bottom. 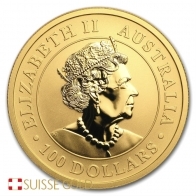 The 1 Ounce Lunar Pig gold coin has a face value of 100AUD. The reverse side of the coin features an image of a pig standing below a cherry blossom branch. 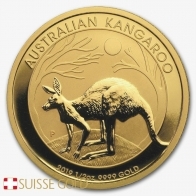 The Perth Mint releases a number of popular coins, including the Kangaroo series, which is available in gold, silver and platinum. Perth Mint also release a gold and silver bar, which are popular with precious metals investors.